Tenerife Walking Festival 2017 will take place from May 23 to 27th 2017. This is an open event to hikers from all over the continent, combining different types of hikes and trails and original supplementary activities. This event brings to the island tours among the most spectacular natural environments varied and attractive complementary activities and its characteristic spirit of respect for the environment. Registrations to participate in the TWF 2017 can be made throughout the month of August 2016 through www.tenerifewalkingfestival.com. “Participants will enjoy some of the best trails of Tenerife, which has 1,500 kilometers of runs with the particularity of an enviable climate all year round and a huge diversity, walking from the mountains of laurel and Canary Island pine to coastal areas or incredible volcanic landscapes, “he said. The festival is open to walkers, whether federal or not, across the continent. This year is expected to reach a figure of about 200 participants, similar to last year, which also have an impact on its exclusive character allows for proper organization of the event and the paths not register a very high volume of users to time, which safeguards its maintenance. 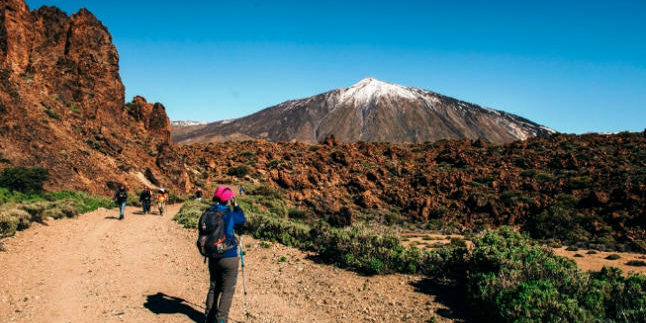 Among the new features this year, the festival expands to 20 the number of paths that can go, and constitute a selection of the most striking of Tenerife. Participants will have the opportunity to enter as unique spaces such as Teno rural parks or Anaga, declared Biosphere Reserve, or the Teide National Park, a World Heritage Site by Unesco. The variety of tours assures that you can choose those that best suit their tastes and fitness of the participants. In addition, four of the five paths of the first day participants will enjoy afternoon routes with accommodation in shelters and shelters to continue the tours the next morning. As in previous editions, the event is much more than a meeting limited to the routes. The festival will be complemented by the intervention of prominent national and international speakers related to hiking, mountaineering and nature. On Saturday 27 May the city of Puerto de la Cruz, who repeats as the official venue of the meeting, again host the grand final of the TWF, with tastings of products of the island cuisine, cooking demonstrations live and an attractive fair active tourism. All in the midst of a great hiker environment for the meeting between the participants and the local crowd moving to live that day with the family. 25/05/2017 – Antequera beach is undoubtedly the most amazing virgin beach of Anaga. Accessible only by sea or on foot, this tour gives us a unique opportunity to enjoy its clear and calm waters. It is an oasis that is protected by the majestic Roque de Antequera. 25/05/2017 – Between the sea of clouds and the sea of foam. This is the first officially approved trail in Tenerife: PR-TF 10 according to the technical nomenclature. This trail offers a great deal of historic and botanical peculiarities about Tenerife. 26/05/2017 – Wine trail. First of all, have a look at the views of the impressive cliffs. Now you will be in excellent spirits to go for the hike. The hamlet of Afur lies on the edge of a rock and is comprised of cave dwellings and small thatched-roof stone houses. 27/05/2017 – Another World’s Landscape. To visit Malpaís de Güímar, get ready to enjoy a natural breathtaking sight. This small piece of land seems to have been pulled out from another world and inserted directly into this area. 24/05/2017 – Home of Guayota, God of fire. This is the most popular trail in Teide National Park, leading to the peak of the volcano, at an altitude of 3,718 metres. The hike starts at three o’clock in the afternoon and finishes at noon the day after. 24/05/2017 – Until the 1970s, this part of Tenerife had little contact with the rest of the Island. The people living on the remote hamlets of the area moved very few times to other more inhabited parts of Tenerife. 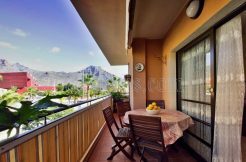 So, Teno kept its quiet and traditional live, based on the agriculture and livestock, and always in harmony with the landscape, the biodiversity and the climate of the area. 24/05/2017 – From north to south. This trail follows the track Camino de Chasna, the most important route between the north and the south of the island when no roads or highways existed. 25/05/2017 – Home of Guayota, God of fire. This is the most popular trail in Teide National Park, leading to the peak of the volcano, at an altitude of 3,718 metres. The hike starts at three o’clock in the afternoon and finishes at noon the day after. 25/05/2017 – An island within an island. Until the 1970s, this part of Tenerife had little contact with the rest of the Island. The people living on the remote hamlets of the area moved very few times to other more inhabited parts of Tenerife. So, Teno kept its quiet and traditional live, based on the agriculture and livestock, and always in harmony with the landscape, the biodiversity and the climate of the area. 25/05/2017 – The region that we cover is one of the last bastions of resistance to the conquest of the Canaries. Although the menceyatos from the south, including Abona, were catalogued as peace menceyatos for their peaceful submission to the Spaniards; fighters from the upper area of ​​the current Granadilla were the protagonists during the last resistance. 26/05/2017 – The last eruption in Tenerife This route crosses an area where took place one of the latest volcanic eruptions in Tenerife. We will hike over the volcanic ash of the Volcán Chinyero, the last volcanic eruption in Tenerife (1909), there, we will see the first signs of life growing on the lava soil, just like a natural miracle. On the way, we will the see the Volcán Chinyero’s lava flows, which contrast with the green of the pine trees. 26/05/2017 – From the sunset to the sky. This is an easy route, ideal for all kind of people. 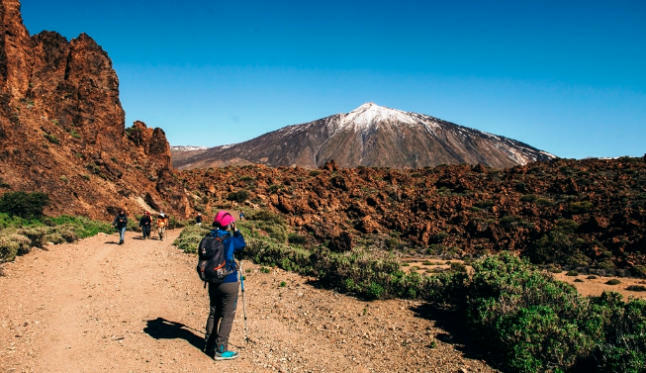 This route offers the opportunity to get the most of the Mount Teide National Park unique flora and fauna. On the way you might see the “alcaudón” (small birds which love eating insects) and beetles such as the “pimelia” (small, black and with bellies). 26/05/2017 – The walk of traditions. During this route you will enjoy of wonderful views over the Chinyero Volcano, where took place the last Tenerife’s volcanic eruption. This eruption started on November 18th, 1909 and lasted for 10 days. In comparison with other volcanic eruptions in the Canary Islands, this is the one that has registered less lava flows. 26/05/2017 – Home of Guayota, God of fire. This is the most popular trail in Teide National Park, leading to the peak of the volcano, at an altitude of 3,718 metres. The hike starts at three o’clock in the afternoon and finishes at noon the day after. 27/05/2017 – A forest of ancient rocks. This is an easy route, ideal for all kind of people. This route offers the opportunity to get the most of the Mount Teide National Park unique flora and fauna. On the way, you might see the “alcaudón” (small birds which love eating insects) and beetles, such as the “pimelia” (small, black and with bellies). 27/05/2017 – Home of Guayota, God of fire. This is the most popular trail in Teide National Park, leading to the peak of the volcano, at an altitude of 3,718 metres. The hike starts at three o’clock in the afternoon and finishes at noon the day after. 24/05/2017 – El sendero recorre el antiguo camino real que a su vez se dibujó sobre una vereda aborigen. Por aquí se llevaban los cerdos, las cabras, el pescado y todo tipo de víveres desde Taganana a La Laguna mientras esta fue capital de Tenerife. 27/05/2017 – Part of this route passes through the shade of the trees of a forest. Part of this lush forest is the result of tree plantations that have taken place in the last 40 years, changing the aspect of the area. 27/05/2017 – The hike covers a part of the GR-131 long-distance hiking path (integrated into the E7 European long-distance path). The trail follows an old forest path leading to the higher area of La Orotava (Aguamansa). This location hosted the first hydroelectric station in the Canary Islands, supplying power to La Orotava with the water volume that flowed from here. 27/05/2017 – Agricultural landscapes and a diverse vegetation of cacti, euphorbias, fayales and heathers can here be observed. The views over the Isla Baja are more than worthwhile and certainly a good reason to take this very pleasant excursion.